Newly launched interactive benchmarking study provides the first-of-its-kind look at nutrition and foodservice industry practices in skilled nursing facilities. 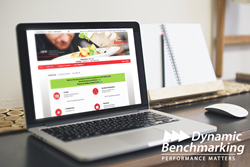 Dynamic Benchmarking, a provider of customized online benchmarking and reporting solutions, is pleased to announce the launch of the first-of-its-kind finance and operations study for the Association of Nutrition & Foodservice Professionals (ANFP). This benchmarking study will provide peer-to-peer comparisons of key financial and operational metrics for its skilled nursing facilities members. ANFP is the nation’s leading organization of professionals involved in the management of nutrition and foodservice. At its highest level, ANFP strives to ensure that dining experiences in settings such as hospitals, long-term care centers and senior living facilities are nutritionally sound, safe, healthy and fulfilling. For some time, the association has received requests from its members for a benchmarking survey that could help them understand how their operations compared to similar organizations, as well as provide an insider’s perspective into some of the best practices in the industry. With that in mind, ANFP convened an advisory group in October 2016 to begin work on a study targeted to its skilled nursing facilities members. Working closely with Dynamic Benchmarking, questions were formulated, tested and the Skilled Nursing Facility Benchmark Program opened for data collection in March 2017. The final survey included questions on facility demographics, personnel information, key financial statistics, foodservice operations, nutrition information, and food safety and sanitation practices. Additionally, Dynamic Benchmarking worked with ANFP to import data from the Center for Medicare and Medicaid on the most common citations for food operations to supplement the information being provided by their members. The Association of Nutrition & Foodservice Professionals (ANFP) is a national not-for-profit association established in 1960 that today has over 14,000 professionals dedicated to the practice of providing optimum nutritional care through foodservice management. The association provides foodservice reference, publications and resources, employment services for members, continuing education, professional development and certification programs. ANFP monitors industry trends and legislative issues and publishes one of the industry's most respected magazines. For more information, please visit http://www.anfponline.org.